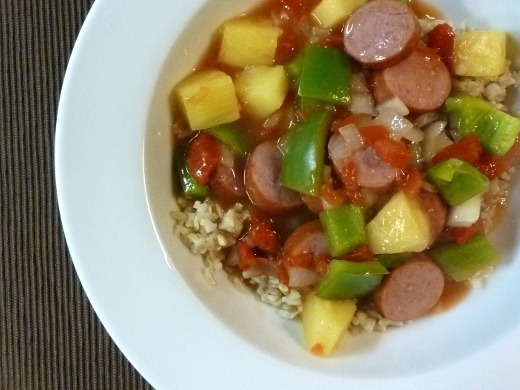 Turkey Kielbasa is my favorite quick protein with which to cook, as of late. I threw this dinner together in minutes last night. The recipe is called Polynesian Skillet Supper and is from Taste of Home (clearly my favorite recipe source!). 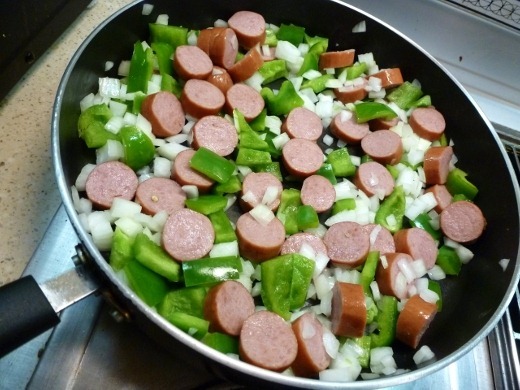 Into a skillet went sliced Turkey Kielbasa, chopped onion, and chunks of green pepper. I pre-chopped the veggies on the weekend, so I just had to pour them out of a storage container – easy peasy. 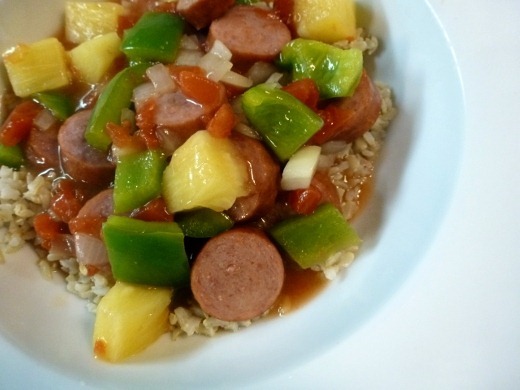 More goodness – canned diced tomatoes and pineapple. 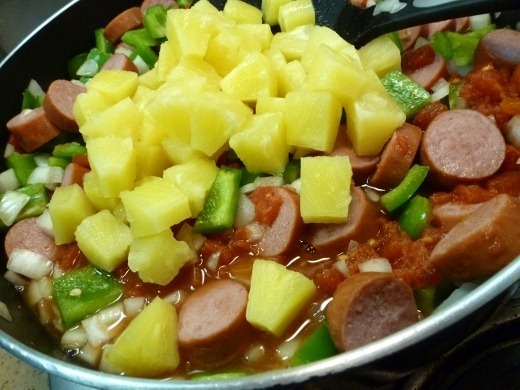 I also added ingredients that thickened into a thick, tangy sauce, including the juice from the pineapple can, brown sugar, beef broth, garlic powder, pepper, and cornstarch to thick. After simmering for a few minutes – dinner was ready! I served this dish atop brown rice. It’s quite colorful and festive-looking, so maybe you can even swing it as a holiday-themed weeknight dinner? Polynesian Skillet Supper: recipe & nutrition facts from Taste of Home. Nutrition: One 1-cup serving (prepared with reduced-fat turkey sausage; calculated without rice) equals 201 calories, 7 g fat. Just one more day to work this week – then I get 12 days off!! Currently listening to: Rebellion (Lies) – Arcade Fire. It’s a great combination of flavors, I loved it!